Welcome and thank you for visiting Ever After Soap. The 2018 Louisianna Renaissance Faire (www.LARF.Org) has now ended and we are going thru the joys of packing up the shop and RV and making the long trip back home. There were some rumors circulating at faire that we would not be returning. Let me put those to rest. We have signed our contract and are looking forward to 2019 at LARF and hoping you will come see us. Once home and settled in production will start to replenish our inventory. We hope there will be minimal delays, if any, on filling online orders. We wish you all the best for the holiday season and the upcoming new year. Our soap is a handcrafted, cold process Castile soap. 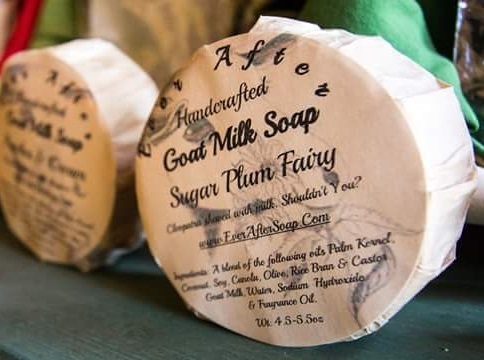 The additional fat from the milk of our pampered (spoiled), hand milked dairy goats gives our soaps, lotions and fizzies extra moisturizing quality. The soap contains no animal product other than the milk. The oils we use are a carefully selected blend of vegetable oils, each bringing a desired characteristic to our soap. And then to ensure a long lasting bar, we age our soap for 4-6 weeks. Currently, our goat milk soap bars are available in more than 24 fragrances (and one unscented). And 5 fragrances of goat milk shaving soap (plus 1 unscented) are offered. Also in men's grooming are Beard Oils, Shaving Oils and Mustache Wax. All are available in several fragrances. While we strive to maintain a plentiful supply of soap in stock, unforeseen demand may delete one or more varieties. For this reason, when you place an order with us, we will ensure that we have we have it on hand and then will send you an invoice. If any part of your order is not available, we will contact you via EMail to resolve the issue. When you click on Place an Order (to right), a form will open. Just enter your information and select the quantity of the products you want. When finished, just click on Submit at the bottom of the form. **Note** If you enter some information and selections and then go back to another page, you lose your entries. To avoid this, don't leave that page until you hit Submit. Or, you can Right Click Place an Order and choose to open in another Tab or window. Then you can go back and forth. If you have any questions or suggestions, please feel free to send us an EMail.